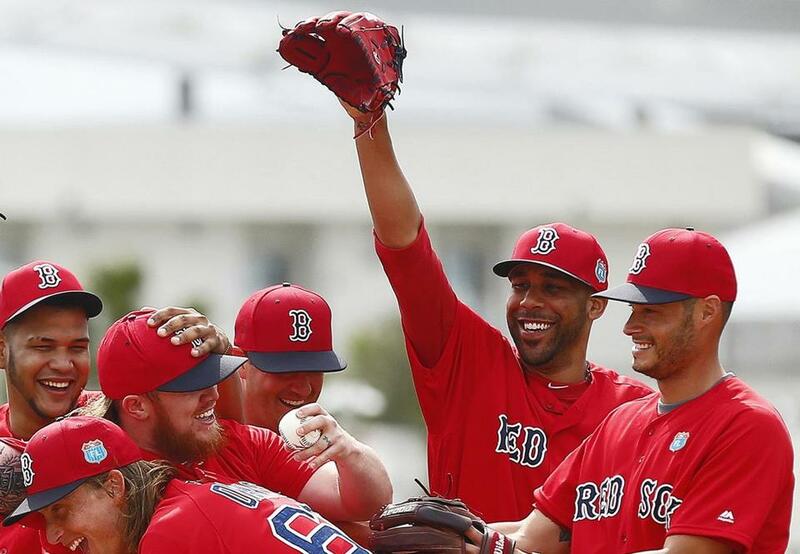 Having the other starters rally around him is exactly what David Price (center) has in mind. FORT MYERS, Fla. — It was easy to carve up the blame pie when the Red Sox season blew up in 2015. It was the starting rotation. Plain and simple. In the early months, when the Sox imploded, they had the most buffeted starting staff in all of the major leagues. Clay Buchholz, Rick Porcello, Joe Kelly, Wade Miley, and Justin Masterson were the Meatball Five, murderers of our baseball season. It had all been a big joke in spring training. Remember? While some of us thought the Sox were out of their minds for letting go of Jon Lester (and John Lackey), the Red Sox tried to convince us that there was no need for an ace. The Red Sox and the Bill James cultists told us that 120 years of baseball tradition were wrong. It was all “we don’t need an ace,’’ “we have five No. 1 starters,’’ and those hilarious “he’s the ace,’’ T-shirts the Sox starters wore in the clubhouse at JetBlue Park. And then the season started, and in a hardball hail of homers and crooked-number innings, it was over before the Fourth of July. Not afraid to admit they were wrong, the Sox last winter responded by giving David Price $217 million to come to Boston and restore order to the rotation. Price, who was roughed up Friday night at JetBlue against the Pirates (5 innings-plus, 4 hits, 2 runs, 1 earned, 5 walks, and 3 whiffs), has come as advertised. But three of the Red Sox 2015 arsonists — Buchholz, Porcello, and Kelly — are still here. Can Price make a difference in everybody else? Do the Red Sox have enough pitching to win the American League East? “Absolutely,’’ Price said. “We have some really good arms in our rotation. It’s just if we can all throw the baseball the way we’re capable of. “Buchholz just needs to stay healthy. He’s one of the best pitchers in baseball whenever he’s out there. We’ve all seen what he can do. Me and him have had many battles when I was in Tampa. “Rick is the same way. I saw him when we were together in Detroit. The way he was able to keep the ball on the ground and pitch deep into ballgames. Porcello seemed to feel the pressure after signing for $80 million last spring and is coming off the worst season of his career (9-15, 4.92). His ERA in three spring starts is 12.00. Buchholz, as we all know, has landed on the disabled list in each of the last six seasons. He has given up 11 hits and seven walks in 10 spring training innings. Kelly, who throws 100 miles an hour, pitched himself back to the minors in 2015. He’s had a good spring thus far. The fifth starter, lefty Eduardo Rodriguez, will start the season on the disabled list after a kneecap popped out of place. He’s likely to be replaced, short-term, by knuckleballer Steven Wright, a 31-year-old pitcher with 11 big-league starts on his résumé. Manager John Farrell knows that his job depends on this group doing a better job this year. So how does he feel about his shaky stable of starters? “This last time through this rotation, this turn, we’ve become more consistent with our command,’’ said the manager. “It still goes down to how we consistently command from the mound. “David Price being at the front of that gives us that leader that I think the rest of our rotation can look up to, can look at. Not to say they are reliant on just David Price being here. It’s still up to the guy walking to the mound to execute as best as possible, but I think we have that one guy that can be a tremendous stabilizer at the front of the rotation. As you can see, the Sox are counting on a lot from Price. They want him to be the ace, and they want him to make the rest of the starters better. Price does not run from this mission. In just a few weeks in Florida, he has worked to change the pitching culture and build camaraderie among the starters. “We’ve been able to watch each other’s bullpens and be together in the dugout, in the clubhouse, in the bullpen,’’ said Price. “We’ve gotten to play quite a bit of golf together. I feel like I was pretty familiar with most of our staff anyway, with Buchholz and Rick. I’m just getting to know the other guys a little better. It’s going well. Buchholz, Boston’s Opening Day starter last year, is happy to cede that job and admires what Price is able to do, on and off the field. “I’ve been watching him for a pretty good time,’’ said Buchholz. “He’s even keel on what he does when he pitches. Everybody knows that he’s really good. He expects to throw a complete game every time he steps on the mound. “To have that mentality and come through as much as he does, you find yourself sitting back and watching and trying to see if there’s anything that he’s doing that you’re not doing. That’s what’s awesome about having a guy like him at the top of the rotation. You can lean on him a little bit and that’s what he’s here for. Price is ready to lead. “I don’t care what I’m called or what I’m titled,” he said. “I just want to go out there and throw the ball the way I’m capable of throwing it and be available. “The Red Sox scored the fifth-most runs in baseball last year. To score that many runs and to be in last place, that’s kind of shocking. So we definitely know the ball is in our court and I think we’re welcoming that.